Well not a printer but something else "LASERS"
I am going to be building a laser cutter/engraver. I have been wanting one and I do not want to buy a cheap piece of china crap on ebay. I have seen many videos on youtube pleading for you not to buy them . And some saying they are ok if you do this,this and this. So I am going to build one. There is tons of information floating out on the interwebs so I am going to tackle this head on. I am going to buy all the extrusions and hardware from FT because John is awesome and I would rather give him my money. I am not certain on which tube I am going to go with . I am thinking 60watt and above. I am planing on doing a cool water cooling system somewhat like we see in some of these water cooled computers. I am looking at a cutting surface of about 500x500 or bigger. I am also not too sure on what drive system . I am currently in the research phase and if any of you guys have some input. I am all ears! Himm well...I have a k40. Great little machine. Only mods really is air assist and cut my exhaust port. I also converted it to run smoothie as I didn't have a dongle to interface with my pc. They area bit small depending on your application it might be fine. I am in the process of making a replacement gantry for the k40, should increase the stock cutting area to about 250x 360 plus onefor the full size of case gantry. I would like a more powerful laser just because but the 40w been doing fine for my needs. I guess best I can say is, don't listen to everything u read, most of it is biased opinions or people with much more money. Way I see it, 300 bucks isn't bad to get started, u can always build a bigger one and transplant the parts, price up a tube, and psu...you won't be far off 300. The thought did cross my mind. And for what you end up getting it really isn't to bad of a deal. I watched many videos on the k40. Many people have made it into a great machine. I have even seen 1 guy stick a 70 watt tube int by extending the chassis where the tube is. But I want something with a bigger cutting area. That is my biggest problem. And the machines that have the cutting area that I am looking for are quite expensive. I just seen that john does offer a 40 watt co2 tube and he also has the high voltage cable . But I think that specs need to be with the laser tube . Like operating kv and length would be something I would need to know before buying. It would be cool if he offered a kit for the laser. I would for sure buy it! I am working on the design in 360. It's going to take a while as there is a bit of a learning curve. If you send them an email usually they are able to give all the info you need on a product. Not sure what info u need but the laser is a 10600nm wavelength, 40w tube easily runs on 40w laser power supply. I already did measurements and it's possible to mount a 40w tube to the Ft-5. Problem is you will need to enclose and vent it. Can you provide more details of what your thinking? I am not sure how you would mount a CO2 laser tube to the FT5 gantry. I am planning on add a laser to my FT5, but was thinking it would be one of the China made laser diode modules. If I am not mistaken, don't most CO2 based laser cutters/engravers, have a fixed tube? Enclosing the printer would be a must with 40 watts. As for the laser itself, a CO2 laser at 10600nm wavelength is much safer than any diode laser. All you need to safely shield your eyes from it is polycarbonate sheeting or safety glasses. The focused spot is of concern simply because it will be intensely bright as the target material is evaporated or ablated. As long as you expand the beam up to perhaps 10mm in diameter you can use open beam paths and only have the mirrors on the moving pieces. That is done all the time on industrial equipment, although keeping optics clean becomes an issue. Then focus it down to a spot at the engraving site using a cadmium selenide (CdSe) lens. Gold or aluminized first surface mirrors are best, but even highly polished copper will work at CO2 wavelengths. Copper works great as a safety shutter too. At laser diode wavelengths however you need special safety glasses dyed to absorb that specific wavelength and 100% beam path control and enclosure for safety. I have designed several pieces of equipment using CO2 lasers and have no particular concerns with them. I have also worked with NdYAG and higher power diode lasers and they concern me greatly, and particularly so in the hands of hobbyists. You would not mount the tube to the gantry. You would project the laser using mirrors. @csorrows That is what I thought as well. However, @cmenchion made it sound like mounting the tub to the carriage was an option. So, I was asking for more insight into what he was suggesting. @Ron you appear very knowledgeable about this. Thanks for chiming in. How are the mirrors typically kept in alignment with the moving head? Is it some mechanical gearing? The appeal of the laser diode is its simplicity. Buy the module, mount it on the carriage, configure hardware and software, PUT ON EYE PROTECTION, and you have a limited, but functioning laser engraver/small scale cutter. I haven't really done any research into using a CO2 based laser, but the mirrors make it sound like a DIY challenge. 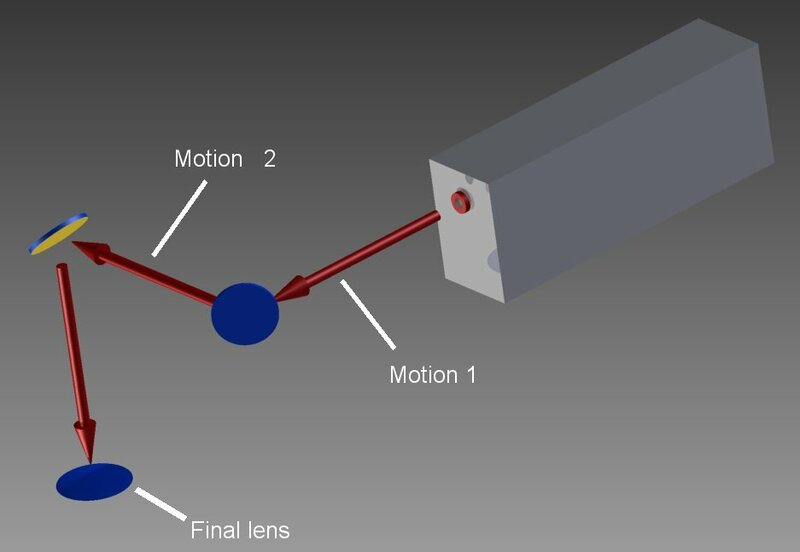 As @csorrows said, the way to use a waveguide or other gas laser is to mount it securely to the frame of the mechanism and use mirrors to move the beam position around. You could also have the first beam segment be vertical. Regardless, it is strongly advisable to enclose the path in metal for safety (it is far too easy to end up looking down the beam path). As for the motions, the beam does not care (within reason) that the length of each beam path segment changes. So for example you could have "motion1" be the Y motion of the gantry and "motion2" be the X motion of the gantry. Mounting the mirrors is not actually that difficult a thing to do. The focal distance from the the lens to the work piece however, is critical. But no more so than the distances and tolerances for Z motions in FDM printing. As for the mirrors and lens, you must use items appropriate for the laser's wavelength. That is the reason I mentioned first surface mirrors (to prevent internal absorption and reflections) and CdSe lens material. ZnSe and silicon (believe it or not) will work fine for lenses too, and mirrors are not all that expensive (like less than $20 each). You could also run a fiber optic cable from the laser output port to the head. Think of it as a "Laser Bowden" setup. Obtaining a flexible fiber bundle compatible with 10600nm could be an expensive proposition though. FleaBay has a used medical CO2 wavelength fiber for around $150. If the laser tube is lightweight enough you could mount it directly to the carriage and run the motions a bit slower to compensate for its mass. Flexible high voltage wires are not all that rare. With a diode laser module you can mount it onto the carriage directly in place of an extruder of course. Or you could use a "Laser Bowden" style fiber optic (much easier to obtain in the diode laser's power and wavelength). The problem is that the wavelength of the diode laser will readily penetrate your cornea and focus on your retina. You could be injured or permanently blinded more or less instantly by lasers of the power being dealt with here. 10600nm on the other hand (CO2 laser output) does not really pass through your cornea so it would only cause surface burns. Not fun and still serious, but far more easily treated and easily shielded against. I have worked with lasers in commercial machining centers and personal projects for over 30 years. I cringe thinking about the proliferation of high power lasers in a "hobby" environment. You can buy them because the personal protection laws in China and places like that are lax or non-existent. That doesn't mean they are safe or advisable to have around, and particularly not so if you have children anywhere around them. I would not have a diode laser machining setup in my home. Period. I have had several CO2 waveguide lasers (both Synrad and Laakmann/Coherant) in my home though while building machines and even showed them to neighbors (with safety glasses of course) while running. Those will be great to do some wood burning or etching. I have been working on design but the gathering parts thing has been put on hold. I changed careers and I took a bit of a pay cut. I worked as a automotive tech for almost 20 years and I moved to assembling custom machines at a great company. I wasn't thinking of bolting laser to my FT5. I was thinking a complete stand alone machine. But my thinking as shifted a bit and I was looking at the cheap K40 laser system that you can pick up for 350 shipped to your door. The working surface of the laser is a bit small for the package that you get but it can be easily modified to make it almost the entire size of the enclosed area. The motion control isn't the best on it either but that can be upgraded too along with just about everything else on it. I know of a certain person that is designing a system that is a drop in to the K40 motion control to upgrade the work surface area. I too have some plans that I have that will work well for this very thing. I know of a certain person that is designing a system that is a drop in to the K40 motion control to upgrade the work surface area. @cmenchion is working on one as well. I have bought a red/black laser so my k40 gantry is also on hold. A BIG red/black laser you mean.